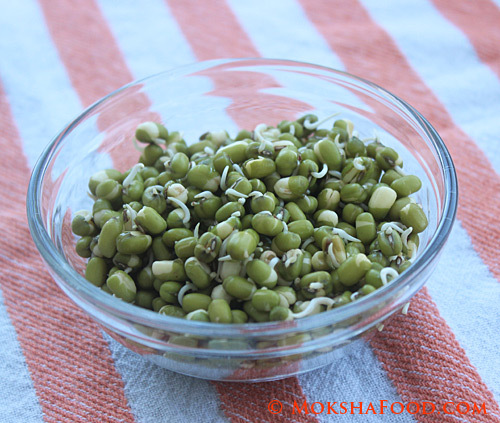 Green Moong/Mung Beans are loaded with fiber and protein and sprouting them enhances these benefits several folds. They are a great source of vitamins and minerals and sprouting adds in live enzymes. Detailed health benefits can be read at this website. Green Moong beans are also regarded very highly in Ayurveda. Its detoxifying properties cleanse the digestive organs of toxins and parasites. Green moong is also considered as miracle food as it ensures blood purification and strengthens the immune system. Sprouting beans is a very easy process but it takes almost 24 hours to complete. So planning is the essential key. You can do this process with moth beans, fenugreek seeds too. Wash the green moong well. Soak in it a large container with lots of water for at least 8 hours. The beans will swell in size. After that, drain out the water and leave the green moong for another 8 hours. I typically soak the beans the previous morning. At night, I drain the water and let it germinate overnight. Next morning the sprouted moongs are ready for preparation. I usually make Green Moong Curry (Muggagathi) or use it to make Kitchdi (Rice and bean Porridge). Today I am sharing two new easy recipes which can be had for a healthy protein packed breakfast or a healthy snack . Add all ingredients to a blender and grind to a smooth paste. Heat a small pan on medium. Coat with a tsp of oil. Drop about 2 tablespoons of batter and spread with the back of the spoon to form a disc. Let it cook for a minute on low-medium heat and then flip over. It should have browned nicely. Cook on other side for another minute. Make the rest of the pancakes in the similar way. Serve hot by themselves or with your favorite chutney or sauce. 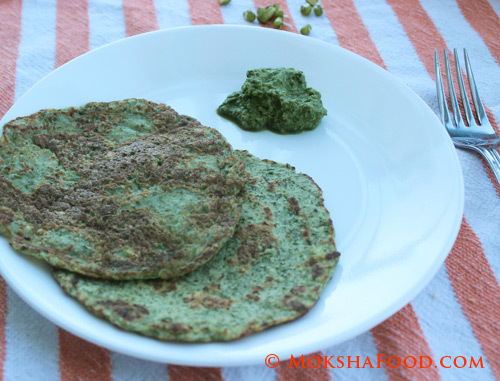 I served green moong pancakes as a healthy breakfast with curry leaf chutney. Soak the Urad dal for about 30 minutes. Add all ingredients to a blender and grind to a coarse paste without adding any water. If your blender needs water, then add a 2-3 teaspoons of water. You can add some rice flour or oat flour if your batter gets runny. Heat oil for frying in a wok or saucepan to high. If your batter is right texture you could take about 2 tablespoons of it and form a flat ball. If not then just drop a tablespoon of batter into the heated oil. Reduce heat to medium and gently drop the balls into the oil and fry them till golden brown on both sides. Remove with slotted spoon onto a kitchen towel. Serve hot with your favorite chutney or sauce. These crunchy fritters can be enjoyed as high protein snack or appetizer. My daughter loved it as an after school snack too. 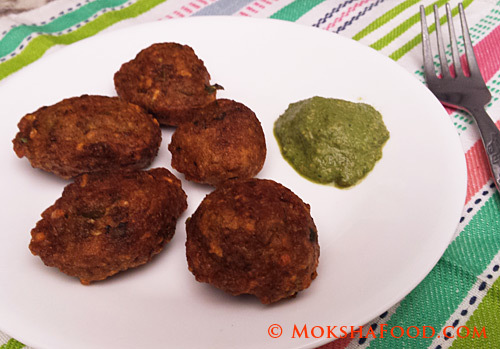 I served sprouted green moong fritters with curry leaf chutney.